Lebanese PM Najib Mikati has suspended his decision to resign as the opposition 'March 14' faction calls for a 'Day of Rage' demonstration during the funeral of a top official killed in a car bombing in Beirut. The opposition bloc has also called on the government to resign over the massive attack Friday that left at least 20 dead and more than 100 others wounded. The blast took the life of 47-year-old Brig.-Gen. Wissam al-Hassan, head of the Internal Security Forces (ISF) and the nation's top intelligence branch since its inception in 2006. Hassan is to be laid to rest Sunday in a funeral that is likely to see massive demonstrations. Mikati said Saturday that he would suspend his resignation in order to give President Michel Sleiman time to deal with the unrest facing the the country following the attack. On Saturday, both Lebanese Christians and Sunni Muslims burned tires and protested against the attack throughout the country, remembering violence in years past and determined not to see a return to the decades-long civil war that resulted. "I am committed to my decision [to resign] but will wait until the president finalizes his consultations with the National Dialogue Committee. However, I am still committed to my original decision,” Mikati told a news conference following an emergency Cabinet meeting Friday at Ba'abda Palace. Both Britain and France have urged Sleiman to avoid a political vacuum at the top at all costs. 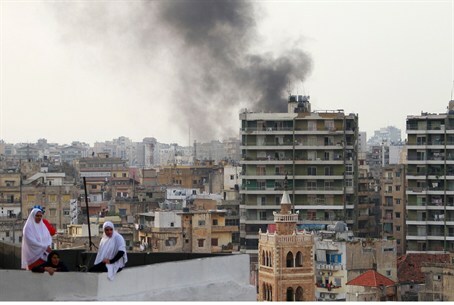 The bombing was considered to be the worst since the 2005 targeted assassination of former Prime Minister Rafik al-Hariri. The intelligence chief is to be laid to rest next to Hariri's tomb in Beirut, according to a report in The Daily Star. Powerful Druze leader Walid Jumblatt placed the blame for the attack squarely on Syria's President Bashar al-Assad. Jumblatt told the AFP news agency Saturday, “The Syrian regime is expert in political assassinations. Our response needs to be political,” he said. Hizbullah terrorists were believed to be responsible for the operational portion of the attack, sources said. The Shi'ite Muslim terror organization, which has representatives in the Lebanese government, is generously backed by Iran, and by the Assad regime in Syria. Hassan was responsible for uncovering a plot to smuggle explosives into Lebanon with the aim of destabilising the country, by Lebanon's pro-Syrian former Information Minister Michel Samaha. Ghassan al-Azzi, a political science professor in Beirut, contended that Hassan's role in foiling the plot placed him at high risk. “Damascus detested him for catching red-handed with explosives [Samaha], the most pro-Syrian of Syria's allies,” Azzi told AFP.